Most of people these days prefer to buy action cameras. And that is why most of companies are working hard to present most impressive designs with rich features. 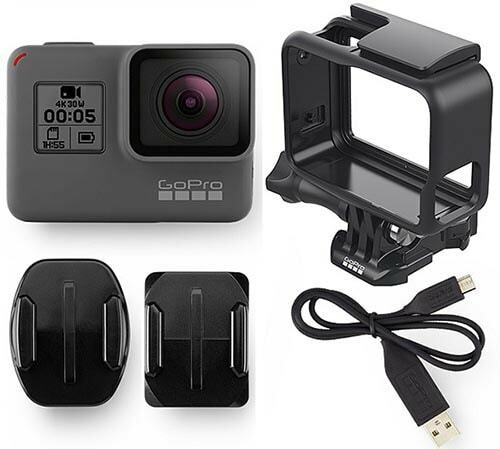 GoPro is a leader among action camera producers from last so many years and recently it announced an outstanding addition to GoPro action cam series: The GoPro Hero5 Black. At the same time Garmin introduced its VIRB Ultra 30 and SJCam entered into market with SJCAM SJ7 Star- all holding 4k recording capabilities. SJCam device is priced almost ½ as compared to GoPro device even with very decent specifications. The article below will provide you detailed comparison between SJCam SJ7 Star and GoPro Hero5 Black. Soon you will be able to make right decision for your investment. SJ7 is designed with metal so that it can offer shock resistant performance. You can also avail a live view type touch screen display on backside and external microphones can be easily connected. Users are impressed with its cool design and impressive navigation menu that assists in easy controls. Hero5 Black comes with rectangular shape and is coated with a rubberised, grippy material to offer better control. The size is larger than its predecessor (Hero4 Black) whereas the Hero5 Black is waterproof without case. SJ7 Star camera comes with F/2.5 aperture lens that can focus for a wide angle of 166 degrees. The frame rate can be adjusted between different video modes as: for 4K you can choose 30fps, 2k works with 60fps and 1080p at 30/60/120fps, for 720 you can have 30, 60, 120 and 240fps rating. For stills you can choose resolution between 3M, 5M, 8.3M, 12M, 14M and 16M but for best results keep it below 12M. Hero5 Black can shoot videos at 30fps on 4K resolution level whereas full HD 1080p works at 120fps. The photos can be taken at 12Mp with three different mode selection options: Night lapse mode, time lapse mode and burst mode. Protune works fine on this device to adjust ISO, white balance and shutter speed along with exposure. If you are looking for the best action camera with 4K capacity, you can check Top 7 Best 4K Action Cameras for 2017. SJ7 Star comes with a built in type EIS sensor that leads to smooth videos without shakes and vibrations. The Gyro sensor and acceleration sensor are combined together to generate impressive results at motion. The video stabilization feature in GoPro Hero5 Black works perfectly even with 4K resolution level. Videos become much smoother when edges are rounded off by stabilizer. It never crop images hence results are always satisfactory. SJ7 Cam allows users to find better results with automatic distortion correction that assists in wide angle shooting for stills as well as videos. In case of Hero5 you can automatically switch to different modes that assist in automatic noise reduction so that users need not to work on post processing. The linear FOV feature makes everything much easier to control for photo modes. Before saving the image file, it applies advanced lens distortion correction via software to enhance the quality. Although most of GoPro cameras suffer with audio quality issue because they need waterproof housing. But GoPro Hero5 Black is designed with advanced waterproof body so audio quality is impressively increased. There are three stereo mics that work without wind noise distortion. You can grab best results even at high speed recording. This device makes use of Type-C USB connectors so you need to connect a Pro 3.5mm Mic Adapter when using a pro-level external mic. On the other side, SJ7 allows connectivity of external mics along with Mono Speakers. If you are looking for the best mics for your action camera, this article Best Microphones for Action Cameras 2017 may help you. If you want to learn more about how to improve action camera sound, read How to improve action camera sound to get some useful tips. The best thing to know about Hero5 Black is that this camera is waterproof even without case. You can use it with as well as without case to enjoy video recording in rainy season. On the other side, SJ7 Cam is able to go under water only with additional case that also increased its overall weight. So if you love diving or want to capture scenes even in heavy rain then go for GoPro Hero5 Black. GoPro mobile application is named as Capture and it can work through Bluetooth and Wi-Fi. It assists in fast sharing and editing along with live view option. SJ7 is Wi-Fi enabled and offers remote control via the dedicated SJCAM Zone application. It works perfectly on iOS and Android devices. We all love GoPro action cameras due to its rich feature set and impressive designs along with post editing facilities. However, SJCAM is not able to perform much better for video quality. If you are a professional then GoPro is best unit for you but for beginners SJCam is even a great camera at low price. SJCam can provide you all amazing features like 4K resolution at 30fps, gyro stabilizer, Touch screen LCD display and Bluetooth remote control.